PSU BSNL has announced the extension offer for recently introduced ‘Special Student’ plan further period of next March, 2016 under Prepaid mobile services. State run Telecom Company Bharat Sanchar Nigam Limited (BSNL) extended its most popular prepaid mobile plan specially designed for Student customers in all Telecom circles upto 31-03-2016. Basically, Student customers consume SMS, data (Internet) and voice calls on mobile plan account. Observing by BSNL has decided to introduce a special Prepaid plan for Student users who are in Colleges and School. As per latest information, BSNL launched Student plan on promotional basis for a period of 90 days from 20th June, 2016 to 27th September, 2016. BSNL to gain more number of young customers has planned to extend the promotion Student special plan upto 31st March, 2016 in all Telecom circles. How to get Student special plan? Students who wish to take new ‘Student Special prepaid plan’ they have visit nearest BSNL customer service center/BSNL Channel partner outlets/Road shows/Exhibitions. Submit CAF details (One latest photo, Address proof) along with Student ID proof. Pay of Rs.118/- for Student Special Plan voucher to activate plan. Recharging Special Combo STV 119 can get 750 MB Data free data usage + 100 SMS (Local/STD) Any Net + Rs 1 Talk Value in Main Account with validity of 30 Calendar Days. After 60 days, use Voice STV 42 / Voice STV 88 to continue in 10 paisa per minute and 30 paisa per minute voice call tariff. 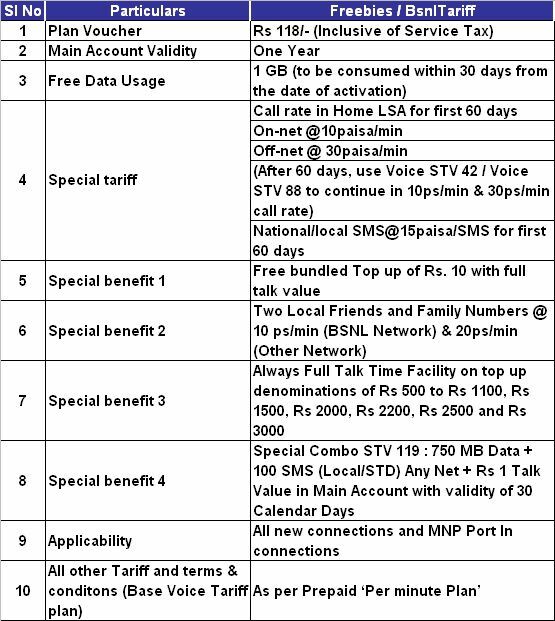 All other terms and conditions as per Pre-minute Prepaid mobile plan.